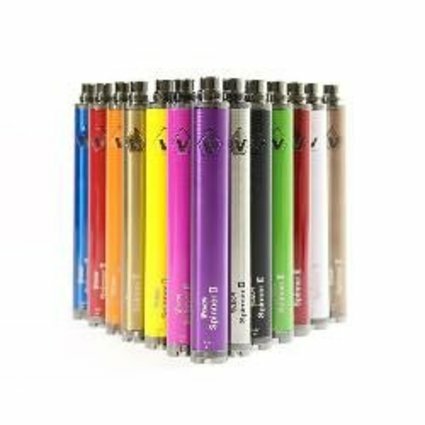 The Vision Spinner 2 1650mAh battery is a high powered battery which takes variable voltage spin technology to the next level in a stylish and durable product. The bottom spinner can be turned clockwise or counterclockwise to adjust the output voltage to the clearomizer between 3.3v and 4.8v. Ego thread. Please note that this battery does NOT include a USB charger. Short Circuit Protection - when the battery is on and is not being operated properly or charged using an improper charger, the power button will flash 3 times and stop working. Working Time Protection - when the power button is pressed for 8 consecutive seconds the button plashes five times and shuts down the power output automatically. Charging Time - the Vision Spinner 2 has a large 1650mAh capacity and requires approximately 5-6 hours to be fully charged from a 0% charge.